At Northwest Propane Gas, we’re proud to install underground tanks that hold propane, a low-carbon energy source made in the U.S. As a gas, propane doesn’t pool or spill anywhere, and it is eco-friendly thanks to its reduced emissions output compared to diesel, electricity, and gasoline. There are no concerns of contamination if propane were to escape from a tank, but it’s also nice to know that the gas is non-toxic and harmless to the environment. Since 1990, the Clean Air Act has established propane as a clean form of fuel. Propane is so pure and clean that it’s actually colorless and almost odorless. To ease detection of leaks, propane manufacturers add odors to it. The installation of any tank is performed according to standards set by the National Fire Protection Association, which handles fire and building safety codes around the world. 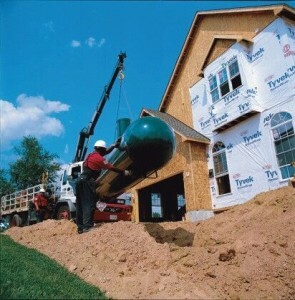 Stored underground, residential propane gas tanks are a hands-off solution for homeowners because we, the retailer, handle installation and maintenance over the life of the tanks, which last for decades. Our delivery technicians can reach tank fittings easily on underground tanks by way of a small dome on each tank that is almost invisible above ground. A cathodic protection system protects underground propane tanks from electrolysis and consequent erosion. This is commonly required by local safety codes. Underground tanks, which can be as small as 125 gallons and as large as 1,000, are best stored in the consistently cool temperatures below ground rather than in the elements above ground. Underground Dallas propane gas storage is affordable to install and maintain. Propane is also quickly becoming popular with eco-conscious consumers because it creates far less greenhouse gas compared to other forms of fuel. For more information about underground propane storage, contact us, the Northwest Propane Gas Company, at 800-274-6121.